Japanese shoppers bought more as prices fell reports the Japanese Cabinet Office. Strong durables shopping and falling prices continue to be a sign of success for Prime Minister Abe’s structural reforms. But, the Bank of Japan’s (BoJ) “inflation-overshooting commitment” to raise prices conflicts with both structural reforms that tend to lower prices and the reality that shoppers buy more when prices fall. The BoJ increased its Total Assets nearly 25% over the past year — over 90 trillion yen – and still has falling prices as measured by consumption deflators. At the same time, the BoJ – like the U.S. Federal Reserve – struggles to manage its foreign exchange rate because of central bank-caused market volatility, actions of other central banks, trader view of Yen as safe currency, and global financial flows. The BoJ should NOT be surprised that shoppers buy more when prices fall – this has been the pattern for about 20 years. Passion for consumer durables continued, increasing at an annualized rate of over 5% from the most recent quarter and over 6% from prior-year-same-quarter per-person — stronger than the U.S. 4.8%. Powerful was the 41% quarter-over-quarter increase in Japanese resident purchases abroad and 43% increase in nonresident purchases in Japan. From prior-year-same-quarter, the growth was 32% and 10% respectively. Population is the problem because per-person spending isn’t bad. It’s difficult to grow spending per person in semi-durables (e.g., clothing) and nondurables (e.g., food and energy). Economic dynamics of long-gone decades have changed due to the tech and trade transformation. More structural reforms will mean competitiveness, lower prices and – hopefully – more babies. Also needed is more support for innovation including intellectual property protection and start-up company support. Monetary policy must embrace this change – it’s a global leadership opportunity for Governor Kuroda. Conflicting policies from the Cabinet and BoJ must be resolved, the longer the conflict continues the more problematic resolution will be. Watch for warnings of consumption fueled by household debt. Focus on opportunities in Japanese durables and services, seeking areas where structural reforms are legally solid and ripe for early mover advantage. To learn how to apply these insights to your professional portfolio, business or policy initiative, contact “editor” at this URL. For all durables, semi-durables and nondurables, and services, shoppers bought more when prices fell and cut back when prices rose (only nondurables). This quarter was a perfect pattern. In quarter-over-prior-quarter changes this relationship holds about 70% of the time, not always as perfect as this release. And, this data will be revised. 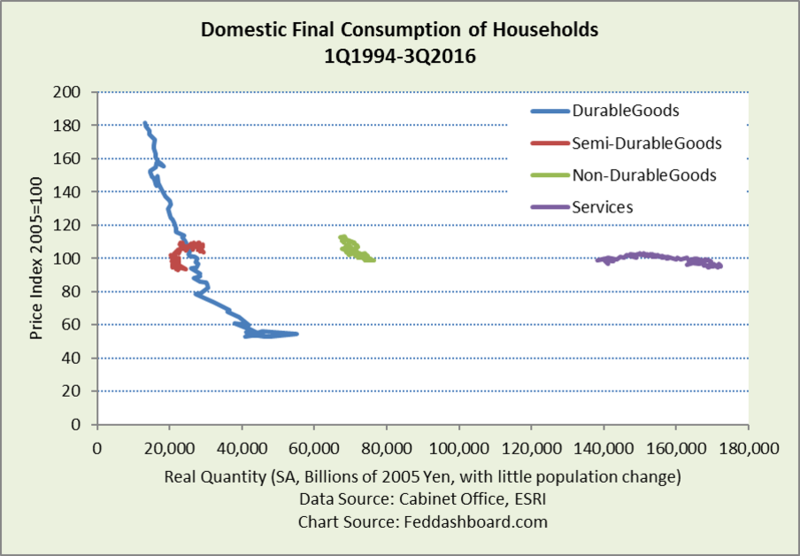 Japanese CPI is misleading because of how it defines households with implications for the “shopping basket” sampled that undercounts falling durables prices.